Hello. I'm Shalini Singh, Owner and Centre Director of Mathnasium of Milton, your neighbourhood math-only learning centre. We help kids in grades 1-12 understand math by teaching the way that makes sense to them. We are excited to announce our arrival in Milton.We are conveniently located on Derry road and Santa Maria Blvd, adjacent to the Milton Sport Center and right next to McDonalds in the brand new Willmot Market Plaza. My son went to Mathenisuim here in Milton Ontario for 6 months and this was our first experience with such a program but the experience was a great one. Learning math is generally not a fun experience for kids, this one was surprisingly a one that attracted our son and made it easy for him to learn math skills that specifically addressed areas of deficiency where he needed help. I guess it's also the center's management (Shilini) and the instructors who collectively manage to press the right buttons and made it easy for our son to attend and learn in a positive and rewarding atmosphere. Thank you Shilini and team. Thank you for all the help my daughter gets at Mathnasium. Great programme. My daughter continues to love going for her sessions and her confidence in math has grown tremendously. Thank you. I recently remarked to my wife that our daughter often enters Mathnasium with all the emotions of her day, but she almost always comes out smiling and cheerful! That speaks volumes about Mathnasium's learning environment! My daughter has only been in the program for 3 weeks but she loves it. They make it fun to learn!! My daughter is feeling very confident at math . My son has been at Mathnasium for a couple of months and just the other day we heard him say multiplication is fun. To think just a couple of months ago my son dreaded math. Now he loves it and it is fun. Words I never thought I would hear but Mathnasium has changed his opinion and has given him the confidence to love math. We have seen such a difference in my son's attitude and behaviour towards school that we have also enrolled our daughter to get her up to speed as well. Thanks for having such caring instructors who want to see the kids succeed and like math. My son has so much confidence since attending Mathnasium. He actually enjoys going to math class now because he understands ! Alecks is still reluctant to go to tutoring? but he does enjoy it when he is there. Shalini has been very responsive to anything we have asked for when Alecks has hit a wall. We see huge improvement in his math skills, especially his mental math. This has improved his self confidence. He also enjoys the math-related activities such as chess and the reward system for finished sheets. For a kid who struggles at school, getting sheets with A+ prominently displayed is so important. Great friendly environment. My daughter feels welcome and comfortable. Great improvement in my kids performance. The staffs are knowledgeable, engaging and helpful. Really friendly and fun environment with knowledgeable instructors. Owner is extradinary! My daughter has been attending mathnasium for the last month and a half. We have noticed good progress with her learning so far. In fact, Her teacher recently wrote a note in her agenda stating the following: "... we worked on subtraction together and she explained how she does things at mathnasium. She was so confident with her concepts and vocabulary and when she did a couple of questions she was able to communicate what she was doing. I'm so impressed!" My grandson is really enjoying the atmosphere and encouragement he receives. He is learning and retaining skills. He looks forward to going. Such a different experience than we had with the previous company. Everything is great. Am very happy with all the efforts Shalini and her staff take. My son loves it and his confidence in math has grown. Great program and instructors! Thank you Mathnasium of Milton for guiding my daughter in math. I see her more relaxed and confident .She is developing her critical thinking skills as her concepts in math clear. I am glad we made our decision to join Mathnasium. Great learning environment and a beautiful Centre. The owner is very welcoming and supportive. Very experienced and knows how to motivate students how to like difficult subject like math. We have been taking our daughter to Mathnasium for about a month, and she is growing in her Math confidence. She aced a math test at school recently, and she is looking forward to doing well on an upcoming unit test. 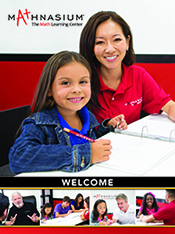 Milton Mathnasium's warm environment and friendly tutors create a great learning environment for my child. Mrs. Singh, the owner, always welcomes her as if she were one of her kids and sets the tone for this wonderful learning environment. This place is amazing!! No kidding. My daughter has gone from being completely panicked at the mention of "math" to saying math is her favorite subject.. She beams with delight when she talks about her day at school. She can't wait for her Mathsanium time after school so Mrs Singh and her team can explain or congratulate her achievements.. Its fulfilling and warming to say the least.. Thank you.